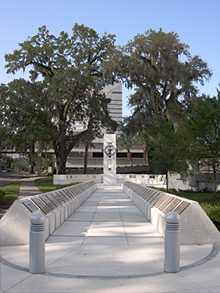 The State of Florida has three official memorials dedicated to veterans located in the capital city, Tallahassee. The sites are maintained by the Florida Department of Management Services. 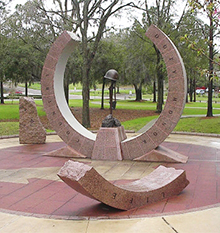 Florida’s World War II Memorial was dedicated on June 6, 2005, by Gov. Jeb Bush. More than 248,000 Florida veterans served in the war. The Sunshine State is currently home to nearly 66,000 World War II veterans. Location: In front of the R. A. Gray Building, 500 South Bronough Street, Tallahassee. Florida contributed $248,000 to the National World War II Memorial in Washington, D.C. — one dollar for each service member who entered the military from Florida during the war. Florida’s Korean War Memorial was dedicated on Dec. 11, 1999, by Gov. Jeb Bush. More than 294,000 Florida veterans served in the Armed Forces during the war. The Sunshine State is currently home to more than 139,000 Korean War veterans. Location: Cascades Park, Downtown Tallahassee. 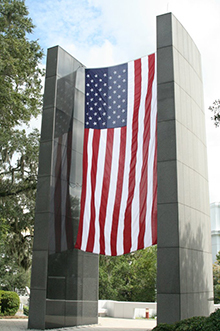 Florida’s Vietnam War Memorial was dedicated on Nov. 12, 1985, by Gov. Bob Graham. The memorial, with its twenty-eight by fifteen foot U.S. flag, contains the names of all known Floridians killed in the war. The Sunshine State is currently home to more than 496,000 Vietnam veterans. Location: Across Monroe Street from the Old Capitol Building, Downtown Tallahassee.